Did you hear about this? I didn't, until fellow New York runner and oftentimes friend Bridget told me about it. 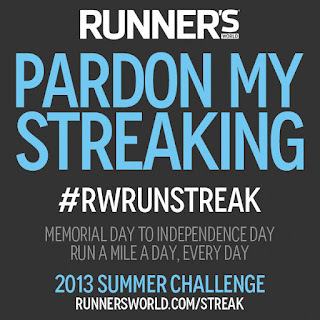 Runner’s World magazine is hosting their annual Runner’s World Summer Run Streak 2013: 39 straight days of running at least a mile per day. It all starts TODAY, May 27th, and lasts until July 4th (book-ending American holidays!). With two marathons coming up in September and October, I’m in no position to get lazy now, even if the hazy days of summer will soon (hopefully) be calling my name. In Paris, summer means running, but also picnics along the Canal with beer and pizza as well as countless hours lounging in the sun at the Buttes Chaumont. Sometimes it’s hard to get the motivation to go out and pound the pavement. Speaking of pavement, the Pavement Runner, who launched the #BostonStrong runs that I helped organize in Paris in April, designed the logos for this endeavor. Check out his blog and get your shoes on. I’ll be running every day, so if you’d like to join – for at least one short mile – let me know and we’ll set the time and place!